The only product of its kind on the market, 22PLE Mistico Elemento combines the advantages of both organic and inorganic technologies delivering unprecedented shine, protection, resistance and self-cleaning effect. Enhances gloss and achieve a dripping wet look! Protects the paint for 3 years! For over five years, 22ple has worked to better the already amazing VX Pro. Driven by the pursuit to develop the best coating possible, 22ple used the pro-only ZX Mistico Elemento as a starting point to enhance the VX Pro. Packed with a new generation of UHMW (Ultra High Molecular Weight) Silica, the VX PRO2 performs much better with only a marginal increase to the cost. In the words of 22ple "UHMW silica is like silica on steroids!" You now need a lower percentage of active silica so it can perform better than previous generations of silica based products. These enhancements make VX Pro2 a great value, while enhancing that deep gloss we all love and protecting for 3 years. This ultimately makes this product not just another coating it is "the coating" other coatings aspire to be. The 22ple VX Pro2 Glass Coating is your answer if you are looking for long lasting protection that makes your paint pop! 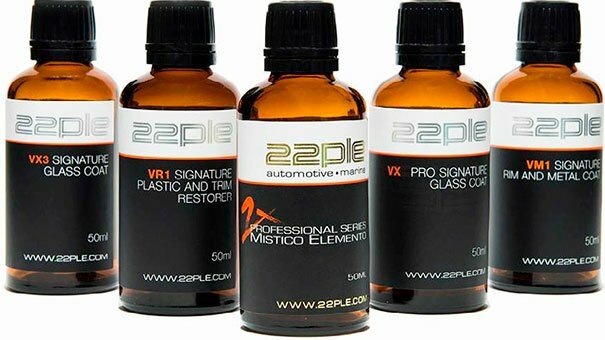 The 22ple VX3 Signature Glass Coating achieves an amazing level of gloss and protection, similar to the 22ple VX Pro, but comes at a much lower price point. This is the perfect coating product to start on and see exactly what 22ple glass coatings are all about! With a durability of two years, as well as the signature 22ple ease of use what is not to like? Did I also mention the famous gloss as well as superior chemical resistance and ease of maintenance? The VX3 provides you everything so your paint is protected year round and looking great! VX3 has a hardness of 7H, ideal hardness for paint coating, but features less silica than the VX Pro or VX Pro2. This allowed 22ple to offer a great coating at a lower price point that everyone can enjoy!